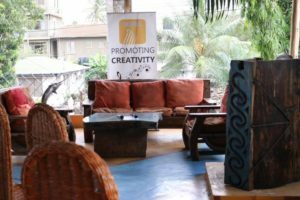 Eco-Sanaa Terrace is an arts space that provides an opportunity for community building and networking among artists and arts lover. The space is located at CDEA’s rooftop located at Plot 25, House 1001, Mikocheni B, near Passionist Fathers, off Mwai Kibaki Road, third gate right on road leading to CEFA office. The space hosts a maximum of 60 people and can be rented for various events which include: Film screenings, professional meetings, corporate events, social events, film interviews and television broadcasts, workshops and seminars, flea markets, digital and visual art and photographic exhibitions, and product launches.